Fog, Mist, Rain - and you call this February? There is an expression that there is no such thing as bad weather, just poor wardrobe choices, and that pretty much sums it up. Still, rain in February is not ideal. The bay is all misty -- but the ice huts are still sitting over fourteen inches of ice, so no chance yet that the boys will need to paddle them homeward. There is still a lot of snow on the ground. This, coupled with rain, sets up for flooding, but the lake levels are very low, so hopefully the ground water can just move on through. You can see how far the lake is pulled down -- those long open bits of sand reaching out from the shore would normally be well underwater, and they run all the way to the end of Clover's dock! So there's room for the lake level to rise. And it will take some thaw before the snowbank at my back door melts... It's an impressive pile of snow. 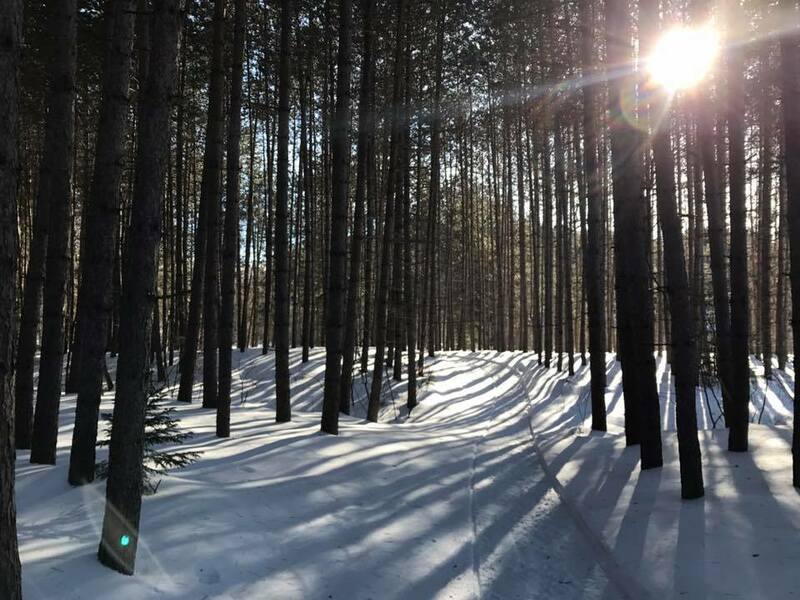 All we need, really, all we need, is for the temps to dip back below freezing for a day, and then bring us a dusting of snow, and all the trails will be open. And the lake will be skateable too, so don't give up on the March break vacation yet!!! Did you know that the Dwight Public Library features a different local artist every month? Along with their great programs, all those books and magazines and movies you can borrow, the computers, the wii game, you can find out which of your neighbours is an amazing art talent. You should stop by. Often. Work of art at Sunflower cottage at Bondi Village Resort. This character came to visit over the Family Day weekend. Feruzeh borrows a snowbank to send some love to her sister. She was here with one of our much beloved Seniors' Groups, and not only was she being artistic with the snowbank, she was leading the group in Yoga every day. And some belly dancing lessons... AWESOME!!! Fox Point Rd. gets its name from one of the Lake of Bays' earliest settlers -- Tom Salmon, who came here in 1870, settled on the end of the point, and (well, you knew this was coming) saw a fox sitting on a rock there when he arrived... Tom came in by snowshoe, following a cut-out survey line that brought him to a location on the Lake called Huckleberry Point. There was a bit rock, about 4 feet high, on the tip of this Point, having on one face the dates 1692 and some initials carved into it. Jokers later tipped this into the water for fun, and it has been lost, along with the mystery of who carved it. He kept going, liking the look of the lake, and after living in various locations, finally settled at the end of what is now the Fox Point Rd. He married Elizabeth on Valentine's Day, 1883, and together they gradually build Foxwood Resort. What began as a haven for fishermen and hunters on their way to what is now Algonquin Park gradually expanded to welcome their families and children, and became its own treasured destination. Tom was world reknowned for his snowshoes and birchbark canoes. He learned how to make these from the local First Nations, with whom he enjoyed a tremendous relationship. His snowshoes were sold as far away as Russia, and were taken along on one of the expeditions to the North Pole.. They were stamped with his mark, an outline of a fish and the word SALMON. I've got a pair of the snowshoes hanging in my porch, small treasures all on their own. Foxwood became one of the Lake's oldest resorts. Tom passed away in 1943, Elizabeth had died the year before. Daughter Anne married J. W. Emberson, and they continued to run the resort, which later passed to their son Clare. Since those days the resort has changed hands a few times. For the last 15 years it has been in the ownership of Rob and Julia Wallace. They have retired, and the resort is now sold, as they have moved elsewhere. The new owners, we are told, will be operating it quite differently, more as a corporate retreat, and the current website simply indicates that it is CLOSED. Certainly, this is an end to an era, and while it may herald a new direction, there will be many who will miss the old resort. Our family has long deep ties with Foxwood, the Salmon family and the Embersons. There were so many delightful stories told, and memories to hold close. We wish the Wallaces happiness in their retirement from Lake of Bays, and we say Hello to our new neighbours (whom we have yet to meet). Since reservations were accepted for the coming summer, prior to the sale, there may be people out there now looking for an alternative place for their summer holiday. Breakfast, awarding the Bob Palmer Volunteer of the Year award to very deserving Tanya Grainger, and then getting down to the fun of the day, with so many activities for all ages. but then, who doesn't enjoy watching stuff 'blow up' in the kitchen? A little of this, a dash of that, and voila, a volcano!!! Lots of treats for sale by the local Public School, and of course, we all had to bring some home. Tug and Jake were patient, kind and enduring, ignoring passing snowplows and taking plenty of trips down to the beach and back. There was snow art, and lots of pop-up games -- baseball, hockey, football and more! or try pedaling a Fat Bike - these are amazing on snow packed trails, but they do give you a workout! The Lions Club have almost reached their goal to build year round accessible washrooms for Dwight Beach. Those will be welcome! The drum circle being set up. When I cam back, it was really crowded. Arts and crafts for little hands. Archery -- and yes, they patiently taught us all how to properly hold the bow and aim. Even if they didn't turn us all into Caitness from the Hunger Games, it is great to try out. Mini putt!!! This was new this year, and what a fun addition. The day wrapped up with a performance by Yuk Yuks Comedy Cabaret. Winter Carnival season is in full swing -- Dorset Snowball is happening Next Weekend. It's worth coming to the north country to enjoy these festivals. Have you stayed with us before, but not in the winter season? 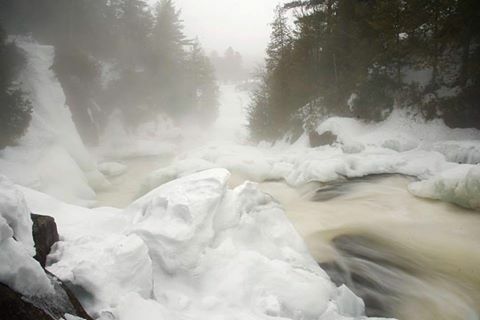 If you have, we'd love to welcome you home for a two night stay during February, or March, to experience us in Winter. No need to get in and out of cars -- once you are here, you can just dress the kids (and yourself), step out the door and be ready to play on our toboggan hills, ski trails, snowshoe trails and more. Grab your camera and check out the beautiful photographs all around. Meet the deer and track the wildlife. Come to the stable to collect fresh eggs from the hens. Grab a board game from the office, and curl up for the evening next to a cosy fireplace while you reconnect with your family. And perhaps with yourself. If you are a returning Bondi guest, but this is your first WINTER VISIT, we'll offer you a 30% discount. If you've spent some winter time with us before, we'll give you 25% off, just because we love you too. And if you've never stayed with us, we'd love to meet you to, and will give you a 20% discount if you mention this post. This offer applies to new bookings only, and doesn't apply over the Family Day weekend. We've got cottages for everyone, from a couple, up to 8 or even 9 people. Maybe you've visited us with a group -- come back on your own, or bring some friends, and extend your Bondi Time. in the world. Just 20 minutes away. Thinking about a March Break, but don't want the hassle of airports and borders? Come on north to our place. We've got lots to do, and lots to explore, and while we're right next door, we're really miles away. 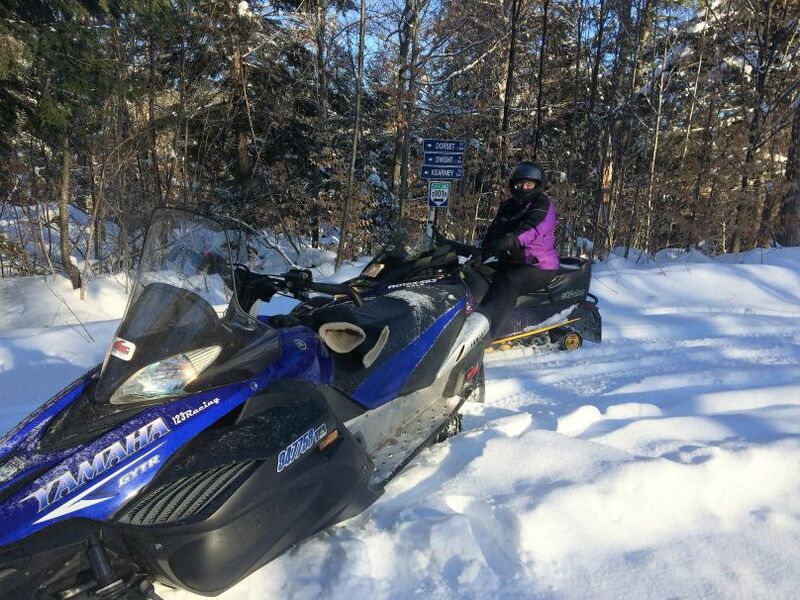 Snowmobiles can be rented locally, delivered right to the resort. certainly the best conditions, in the province. Bring the kids -- ski at Hidden Valley (don't worry, if you've never tried, they will teach you and get you out on the hills after just one lesson! 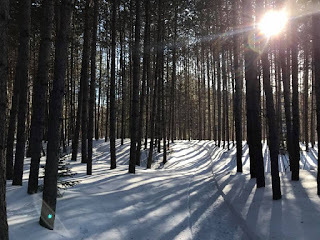 ); ski cross country on our quiet trails, take in the ice skating trail at Arrowhead Park, spend some time in Algonquin Park checking out the Visitor Centre and hiking trails, slide down our toboggan hills, and keep your camera ready - there's lots of wildlife to see right here. Take advantage of our special rates for Couples and Seniors, and our March packages. What view did you wake up to today? These pictures were taken from the bedroom window of one of our cottages this morning. 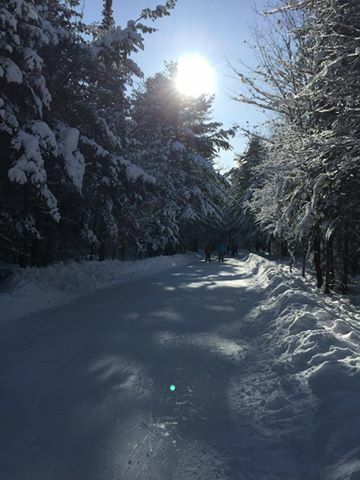 Dave and Brian were out breaking track, getting our ski/snowshoe trails back in shape after that freezing rain that came through very briefly last week. A quick pass with the track setter and all 25km of them were back in perfect shape! Come by and try them out for yourself! They are even better now, we've had a LOT of fluffy snow to top them up! 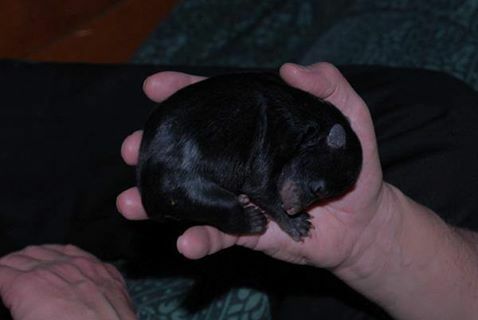 Bear cubs are born in mid-winter, and they are tiny. Truly tiny. Less than a pound tiny. Why are they born so small? and why in winter? The black bear schedule for mating and birthing seems to be arranged to maximize opportunities to eat when the eating is good. They mate in late spring and early summer before berries ripen. This is especially important where fall foods are lacking, as here in northeastern Minnesota. If females can’t find enough berries and hazelnuts (a summer nut), they can’t maintain their pregnancies. To avoid having cubs when they would interfere with feeding, they have delayed implantation. The fertilized egg develops only to the blastocyst stage and does not implant in the uterine wall and begin developing into an embryo until November or early December. By that time, the mothers are in dens and have reduced metabolic rates, which means less oxygen consumption. It also means there is no food intake to help nourish embryos in the uterus. Mothers are living off their fat and nourishing their embryos with glycogen from their muscles. Fatty acid molecules are too big to diffuse through the uterus to provide energy for the embryos. There is a limit how much glycogen they can burn up, so they give birth when the cubs weigh only ¾ pound and are smaller, relative to the mother’s size, than any other placental mammal. This photo shows our friend Mike McIntosh of Bear With Us holding an approximately one month old orphaned black bear bear cub in his hand. The cub was abandoned by the mother when loggers disturbed the den, and when she didn't return, the cub was rescued, raised by Mike and released into the wild when appropriate. Wow, Congratulations! Talk about being "on Point!" One or our amazing "Bondi Kids", Heather Lehan, is off to great adventures. Heather is now focused on the next stage – getting a spot as an apprentice with a professional dance company and then working her way up the ranks. 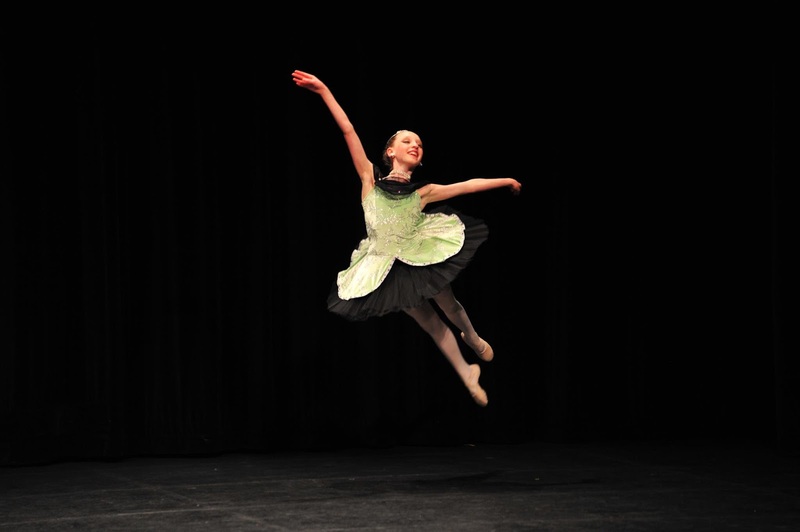 The prize money allowed her to travel to Europe last fall where she attended the Hamburg Ballet School for a few weeks through a learning exchange with the National Ballet School. She also visited the Semperoper ballet company in Dresden and the Norwegian National Opera and Ballet Company in Oslo. She had to come home, though, for a role in The Nutcracker. Her sister Nancy is also a graduate of the Ballet School, in the teacher training program, and works for the school’s community outreach initiative called Sharing Dance. Dance is in the family, it seems. We think our Bondi Kids are amazing. We look forward to watching Heather soar to great heights in the ballet. You can read the whole article here. On the night of February 3rd, we suffered what is called a "catastrophic failure" when an uneven accumulation of snow on the riding arena roof brought the structure to the ground. Fortunately, there were no riders and no horses in the building at the time. We got a little bit of notice, with things popping and creaking, and were all able to get well clear. It has kept us busy, though, with calls to Insurance and trying to salvage what we can. It is very very sad... Such a beautiful building, and so very useful. We already miss it!! !